One of the world's most popular herbicide – Roundup – is making its way back into the headlines in regards to its health and environmental effects. Monsanto, the producer of Roundup (glyphosate), claims this herbicide is safe; however, study after study from independent researchers is showing the exact opposite. A new research study is showing that small amounts of exposure – up to thousands of times lower than permitted in drinking water in the U.S. – can produce unfavorable and concerning effects in the liver and kidneys. Could this study be the turning point for finally phasing out Roundup in agriculture? 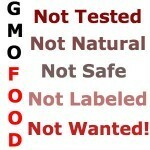 Or will it simply be ignored and human health continue to suffer? According to U.S. estimates, the use of glyphosate, or Roundup, has increased more than 250 times over the past 40 years. 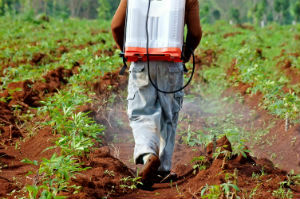 There are scientists who suggest the use of the popular herbicide could be a contributing factor into the widespread kidney disease epidemic in Sri Lanka, India, and Central America. Many genetically modified seeds, also produced by Monsanto, can withstand Roundup, making the issue even more problematic. If GMO plants are beginning to resist glyphosate, then more and more dangerous chemicals are being used during the process, resulting in more exposure among humans and animal life. 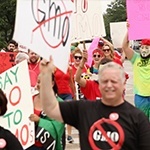 One of the newest herbicides to come from Monsanto is said to override GMO seeds' resistant effects; however, this herbicide is also said to be even more dangerous to human health than Roundup. A new study first of its kind to examine the impact of Roundup on liver and kidney health is indicating that low levels of exposure can result in significant organ damage. The study administered a small amount of Roundup to the drinking water of mice – a concentration that is considered thousands of times lower than what is allowed in U.S. drinking water. After two years, the consumption of the glyphosate-laden water seemed to have spurred kidney and liver damage. The study also compared the female mice and found changed gene expression in the organs, suggesting potential increased risk for a variety of diseases. When genes are disrupted, or turned on and off at the wrong time, it could lead to consequences in a number of different facets of health. Due to Roundup's pervasiveness in our environment, complete exposure to the chemical herbicide may not be practical. You can, however, take precautionary steps toward preventing overexposure. If you purchase most of your food organic, you can reduce your exposure to all herbicides and pesticides. You will also be reducing your consumption of GMO foods, which simply does not have enough research behind it to determine its safety. Because many herbicides can be found in small quantities in drinking water, it may also be wise for you to invest in a water filtration system. Performing a kidney cleanse, eating foods that support your kidneys, and regular liver cleansing may also be helpful for reducing your toxin load. What are your thoughts on Roundup and other herbicides? Please let us know in the comments! Channa Jayasumana, Sarath Gunatilake, and Priyantha Senanayake. Glyphosate, Hard Water and Nephrotoxic Metals: Are They the Culprits Behind the Epidemic of Chronic Kidney Disease of Unknown Etiology in Sri Lanka? Int J Environ Res Public Health. 2014 Feb; 11(2): 2125-2147. doi: 10.3390/ijerph110202125. Gilles-Eric Seralini, Emilie Clai, Robin Mesnage, et al. Republished study: long-term toxicity of a Roundup herbicide and a Roundup-tolerant genetically modified maize. Environmental Sciences Europe 2014, 26:14. doi: 10.1186/s12302-014-0014-5.